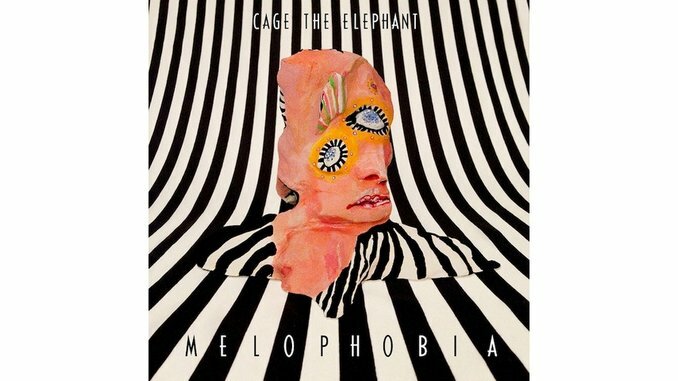 Bowling Green, Ky. isn’t the place one expects to find the hot pink center of a post-modern glam revival, but that’s where Cage The Elephant—whose Melophobia is a glitter-flecked triumph of banging power pop—calls home. Propulsive choruses, a musical cacophony that whirls and a melodic sense that secedes nothing to the rhythms, the scrappy quintet’s third album is a focused, frenzied affair. With six slamming chords, “Spiderhead” opens Melophobia with a throb and wash of fuzz-tone guitar. Suggesting The Sweet with a touch of Mott the Hoople and a bit of Ziggy Stardust, Cage the Elephant flexes a bravado that makes the Kings of Leon’s brazen swagger seem almost crude. Vocalist Matt Shultz’s torn-open wail makes him a relentlessly romantic, if tortured, figure. That promise delivers on “Come A Little Closer,” a song whose tempo surges and recedes, then surges again. The refrain’s “Come a little closer, then you’ll see” repeated over and over, becoming an almost narcotic invitation—and one seemingly designed to engage girls as well as boys. “It’s Just Forever” finds The Kills’ Alison Mosshart taking the Ellen Foley turn from Meatloaf’s “Paradise By the Dashboard Light” to create a startling eruption that blasts the female perspective into a tale of obsessive die-by-my-side sort of love. After opening with lacerating guitars, the song moves into buzzy bass-driven verses, only to culminate with a fade to cheap toy piano. Melophobia’s a crazy quilt of sounds and influences. “Telescope” suggests Abbey Road building to a Bowie-esque chanted chorus, then dry finish, while “Take It Or Leave It” merges a Daft Punk disco shuffle on the verses then disrupts it with choruses that swoop into an “I Wanna Hold Your Hand”-style melody delivered via bulked-up Southern California pop arrangement. What’s thrilling about Jay Joyce’s production is not only are the sonics clear—each instrument captured at its most resonant—but there’s a freewheeling sense of the commonality amongst genres. Indeed, a minor key spoken free jazz denouement on “Teeth,” punctuated by almost atonal horns, collapses into the sparkling Big Star homage “Cigarette Dreams,” traces of The Kinks and Replacements wafting through. Yet for all its kaleidoscopic glory, Melophobia is united in both the urgency of the performances and the seemingly toxic love affairs that populate these songs. “Hypocrite” is an ether bit of horn-flecked call-out, while “Black Widow” spells it out. For anyone shattered by love, intoxicated by the wrong kind of paramour, this entertains via pain—delivering a feel-good catharsis in the process.